White-backed Woodpeckers (Dendrocopus leucotos) are always high on WP-birdwatcher´s lists. But the subspecies lilfordi is even a better mega bird. 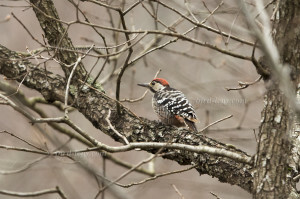 After having seen birds of the lowlands, I wanted to make the next day the big day for woodpeckers. Starting off very early, we noticed that the weather was however very misty with some little showers in the lowlands. When we ascend to the oak mountains we fear to be right in the middle of the clouds but encountered quite nice, dry but overcast weather for woodland birding. We drove all the way up inside Strandzha Nature Park, to the Silkosia Nature Reserve. This is a reserve up in the hills, just 15 km as the crow flies to the Turkish border. Silkosia is situated 2 kilometers north of Kosti village and 1 kilometer east of Bulgari village. Around 260 species of land plants have been found in the reserve. It conserves the most typical and relict Oriental beech (Fagus orientalis), which is a deciduous tree highly preferred by our main target species, the White-backed Woodpecker (Dendrocopus leucotos lilfordi). Other tree species dominate the oak forests with Sessile Oak (Quercus petraea), Strandzhan Oak (Quercus hartwissiana), Hungarian oak (Quercus frainetto), Common Hornbeam (Carpinus betulus), Oriental Hornbeam (Carpinus orientalis) and small-leaved lime (Tilia cordata). Undergrowth is characterized by Pontic Rhododendron (Rhododendron ponticum), Cherry Laurel (Prunus laurocerasus), Caucasian Whortleberry (Vaccinium arctostaphylos) and Black Sea Holly (Ilex colchica). 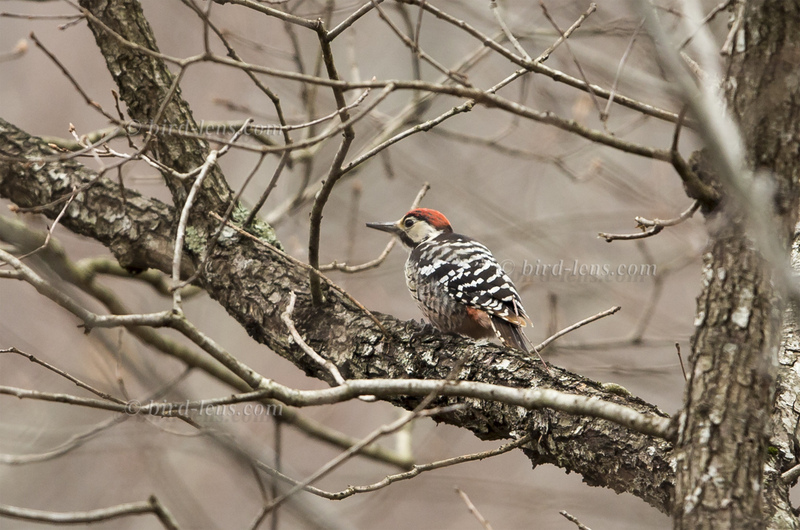 We were out the entire day and until we managed to count all our targeted woodpeckers. Walking through a very pretty mixed deciduous forest I was quite surprised at how pristine and vast these woods actually were. Only a car now or then, but otherwise it was very peaceful in the area. Many brilliant Cyclamen (Cyclamen persicum) and Yellow Crocus (Crocus sativus) in almost full bloom created the first impression of the flower carpet. Among the woodpeckers, we were particularly entertained by four very showy Grey-headed Woodpecker (Picus canus). Obvious always a couple of foraging individuals were found during the day. We enjoyed superb scope views as they were in display between beech and oaks not far from the road. Additionally I had a very impressive Black Woodpecker (Dryocopus martius), passing by calling and a pair of Great Spotted Woodpecker (Dendrocopus major) feeding on an old Hornbeam. a But the highlight was a couple of sought-after White-backed Woodpeckers. The Woodpeckers were feeding very quietly in a steep and quite inaccessible valley with oak patches in the forest; an pretty unusual habitat for the species. Interesting was, that they were not calling nor drumming. Maybe they were not in courtship mood already. A surprise was at least one Middle Spotted Woodpecker (Dendrocopus medius), which was seen right beside the White-backed Woodpeckers. One individual showed particularly well and was very vocal with its typical mewing call. Another surprise during White-backed Woodpecker observation in the last few hours of daylight was “hoot”-calling of two Tawny Owls (Strix aluco). Interesting that I heard calling them in complete daylight. Although Bulgaria is a member state of the EU, it is highly recommended to hire an experienced English-speaking local bird guide for a birding trip. A highly recommended guide is Pavel Simeonov. Pavel is one of Bulgaria’s leading naturalists and ornithologists. Being actively involved with conservation programs at national and international level Pavel is able to provide a wealth of background information on wildlife matters. He has conducted numerous trips as a bird-guide and leader throughout Bulgaria, Azerbaijan, Romania, Belarus, Ukraine, Russia, Croatia, Southern France and Norway. He is also the founder of the Bed & Birding concept. To cope with the growing demand for top shots of the rarer species of the Palearctic Bird-Lens is keen to enrich the range of pictures of birds you can find in the western palearctic. Trips to remote places like this one to capture images of rare birds of western palearctic were very successful. The nice image of the blog is only a first impression, what you will find in the gallery in the “Pictures Shop” very soon. Just give a message, if bird-lens.com could serve you with an image needed before the new pictures are online.